DISCLAIMER: 36 Month lease. 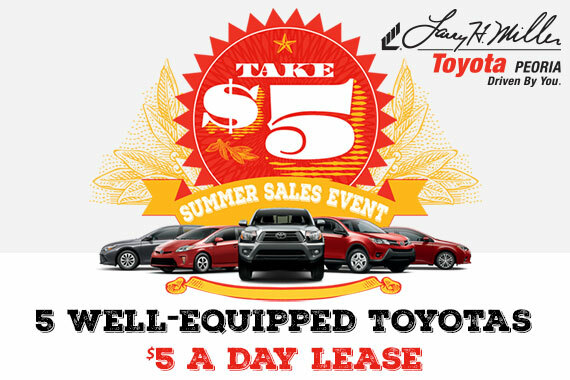 2015 Corolla LE, Rav4 LE FWD, Camry LE, Tacoma PreRunner Double Cab, and Prius Two. Monthly payment $150 ($5 day). $2,450 , $3,000, $3,150, $6,525, and $3,780 due at signing. 12k miles/year. $0 Security Deposit. Per day average lease calculation based on 30 day month. Lessee may be responsible for additional charges upon the expiration of the Lease term based upon the difference between the residual value in the vehicle and its realized value. On approved credit. Offers plus tax, title, license, and $399.95 dealer doc fee. Expires 7/31/15. Disclaimer for cruise: **With the lease or purchase of any new 2014/15 Toyota vehicle. Recipients will experience a 4 Night Carnival Cruise for two to Key West or Cozumel or Freeport & Nassau, or Catalina Island & Ensenada, Mexico based on their port of sailing. Airline tickets, transfers, port charges, and miscellaneous expenses not included. Includes all meals and most shipboard activities. No alcoholic beverages. Booking and port fees are $198 per adult to be paid by credit at the time of booking. A $40 registration fee is also required by the booking agent: Travel America. Subject to availability at time of booking. Customer responsible for transportation to seaport. See dealer for complete details. Offer ends 7/31/15.